Background/Aim: The prevalence of diabetes is on the rise globally causing excessive burden on the health systems. Pancreatic beta-cell mass destruction/neogenesis/proliferation (seen in type1diabetes) and/or malfunction (type 2 diabetes) have been implicated in the aetiology, pathology, progression as well as in responses towards therapies and disease managements. Oxidative stress and alterations in mitochondrial energy metabolism play important roles in diabetes-induced cellular complications. Several studies, including our own, have suggested that Rin-5F pancreatic beta cells are extremely susceptible to oxidative stress due to excessive production of endogenous and exogenous reactive oxygen/nitrogen species (ROS/RNS) and low antioxidant defences, particularly, associated with GSH metabolism. Our aim was to investigate the molecular mechanism of streptozotocin (STZ), a beta cell-specific antibiotic, cytotoxicity in pancreatic cells. Methods: Rin-5F cells were treated with STZ under varying conditions to study oxidative stress-related changes. Results: Our studies have suggested that treatment of Rin-5F cells with STZ, inhibits cell survival and induces cytotoxicity by altering cellular survival and apoptotic signalling and gene expressions. Increased oxidative stress with increased DNA fragmentation and oxidative protein carbonylation were seen in STZ-treated cells. We also observed that beta cells treated with high glucose (up to 25mM) exhibited enhanced cytotoxicity. Cells exposed to conditions mimicking diabetes (hyperglycaemia) were under elevated oxidative stress and showed increased apoptosis and altered redox homeostasis leading to increased cytotoxicity. N-acetyl cysteine (NAC) treatment attenuated these changes in STZ-treated cells. Conclusion: These results may have implications in understanding the mechanism of beta cell survival/death in response to potential therapeutics/managements as well as in the aetiology and pathophysiology of diabetes. Streptozotocin (STZ) is an antibiotic often used in the treatment of malignancies. STZ exhibits pancreatic beta-cell toxicity and is commonly used to induce diabetes in experimental animals., Beta-cell toxicity and diabetogenic properties of STZ are mediated through diverse mechanisms, including targeted uptake of STZ in beta-cells by glucose transporter 2 receptors and increased oxidative stress due to nitric oxide release and ROS production.,, The exact mechanism of targeted beta-cell toxicity is, however, not clear. STZ induces beta-cell dysfunction and apoptosis at lower doses while causing beta-cell necrosis at higher doses.,, Our previous study has demonstrated that STZ induces oxidative stress in HepG2 cells in vitro. In a recently published study, using Rin-5F cells, we observed that STZ induces ROS/reactive nitrogen species production in the treated cells, accompanied by mitochondrial dysfunction causing reduced synthesis of ATP. In the present study, we further investigated the precise molecular mechanisms of STZ toxicity and oxidative stress-related metabolic changes on pancreatic insulin-secreting beta-cells, Rin-5F (Rin-5F is a secondary clone of the rat islet tumour cell which preserves most of the islet secretory functions, secretes insulin and contains membrane-bound secretory granules). In addition, we have also investigated the effects of STZ on cell survival and apoptosis in the presence of high glucose as well as the protective effect of N-acetyl cysteine (NAC) on STZ-induced cytotoxicity. STZ, NAC and 3-(4,5-dimethylthiazol-2-yl) -2,5-diphenyltetrazolium bromide (MTT) were procured from Sigma-Aldrich (St. Louis, MO, USA). 2',7'-dichlorofluorescein diacetate (DCFDA) was purchased from Molecular Probes (Eugene, OR, USA). Apoptosis detection kits for flow cytometry were purchased from BD Pharmingen (BD Biosciences, San Jose, CA, USA). Kits for caspase-8 assay were purchased from R&D Systems Inc., MN, USA, and that for protein carbonylation assay were from Cayman Chemical, Ann Arbor, MI, USA. Rin-5F cells were purchased from American type culture collection (Manassas, VA, USA). Polyclonal antibodies against heat shock protein 70 (Hsp-70), heme oxygenase-1 (HO-1) and beta-actin were procured from Santa Cruz Biotechnology Inc. (Santa Cruz, CA, USA). Reagents for cell culture, sodium dodecyl sulphate polyacrylamide gel electrophoresis (SDS-PAGE) and Western Blot analysis were purchased from Gibco BRL (Grand Island, NY, USA) and Bio-Rad Laboratories (Richmond, CA, USA). Rin-5F cells, insulin-secreting beta-cells, were cultured in RPMI-1640 supplemented with 10% foetal bovine serum in the presence of 5% CO2–95% air at 37°C. Cells were treated with different doses of STZ (dissolved in citrate buffer, pH 4.4 and diluted in RPMI to appropriate concentrations just before use) for different time intervals (2–48 h) as described before. Control cells were treated with vehicle (citrate buffer, pH 4.4 diluted in RPMI) alone. In some experiments, cells were treated with media containing higher concentration (25 mM) of glucose in the presence or absence of 10 mM NAC. After the desired time of treatment, cells were harvested, washed with phosphate buffered saline (PBS) (pH 7.4) and homogenised in H-medium buffer (70 mM sucrose, 220 mM mannitol, 2.5 mM HEPES, 2 mM EDTA and 0.1 mM phenyl methyl sulphonyl fluoride, pH 7.4) at 4°C. Cellular fractionation to prepare mitochondria and postmitochondrial fractions was performed as described before. 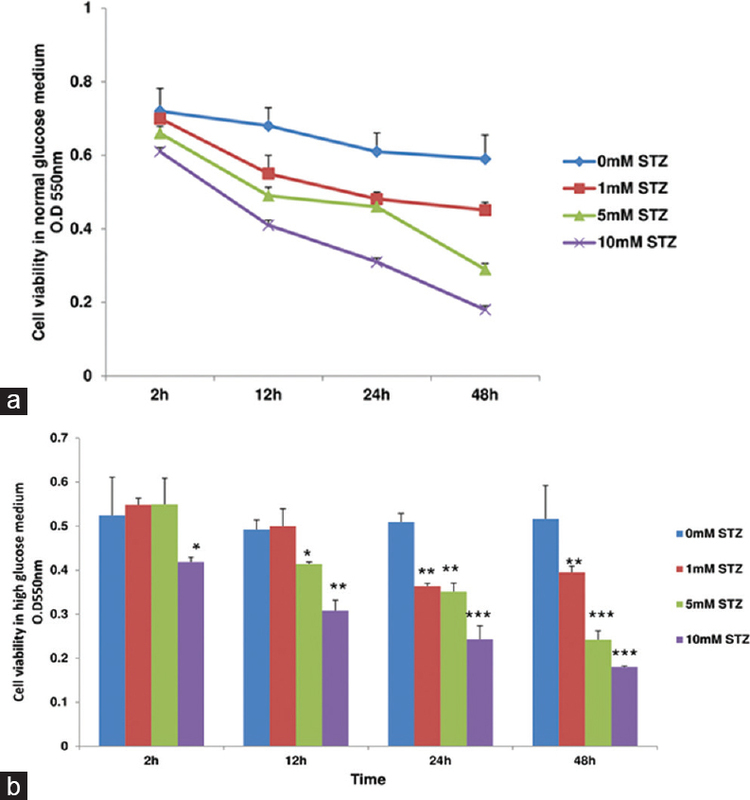 After treatment with appropriate doses of STZ for appropriate time intervals, cell survival was measured by MTT assay to determine the mitochondrial enzyme-based cellular viability after treatment with different concentrations (0–10 mM) of STZ for different time intervals (2–48 h) in high-glucose containing medium and compared with the behaviour of cells after STZ treatment in normal-glucose containing medium as described in our previous study. DNA fragmentation is also an indication of ROS-induced oxidative stress, related to the induction of apoptosis. DNA breakdown was measured using electrophoresis and staining of the separated DNA fragments with ethidium bromide as described before. Oxidative protein carbonylation is an irreversible, covalent modification of proteins by the end-product of lipid peroxidation under oxidative stress conditions. This was measured by dinitrophenylhydrazine (DNPH) coupling method according to the vendor's protocol as described before. Briefly, total lysates from STZ- and/or NAC-treated cells were treated with DNPH dissolved in 2 N HCl for 1 h. The trichloroacetic acid (TCA)-precipitated proteins were washed with ethanol-ethyl acetate (1:1) and the DNPH-coupled proteins were then measured spectrophotometrically at 366 nm. Apoptosis was measured by fluorescence activated cell sorting (FACS) analysis according to the vendor's protocol as described before.,, Briefly, STZ-treated and control untreated cells in the presence of normal and/or high glucose were trypsinised, washed in PBS and re-suspended (1 × 106 cells/ml) in binding buffer (10 mM HEPES, pH 7.4, 140 mM NaCl, 2.5 mM CaCl2). A fraction (100 μl/1 × 105 cells) of the cell suspension was incubated with 5 μl annexin V conjugated to fluorescein isothiocyanate (FITC) and 5 μl propidium iodide for 15 min at 25°C in the dark. 400 μl of binding buffer was added to the suspension and apoptosis was measured immediately using a Becton Dickinson FACScan analyser. The method was able to distinguish the apoptotic cells from the viable and necrotic cells. Apoptosis was also assessed by measuring the activity of caspase-8 enzyme. Cells (2 × 106 cells/well), grown on 6-well plates, were treated with different concentrations of STZ at different time intervals in normal-glucose containing medium. Caspase-8 activity was measured in the cell lysate using a caspase-specific peptide substrate, with the amino acid sequence, Ile-Glu-Thr-Asp, conjugated to reporter p-nitroanaline molecules. Cleavage of this peptide by caspase releases the chromophore which is measured colorimetrically at a wavelength of 405 nm as described in the vendor's protocol (R&D Systems). Proteins (50 μg) from cellular extracts were separated on 12% SDS-PAGE and electrophoretically transferred on to nitrocellulose paper by Western blotting.,, The immunoreactive protein bands were visualised after interacting with primary antibodies against oxidative stress/apoptosis marker proteins. Beta-actin was used as loading control. After development of the blots, bands were visualised and densitometric analysis performed using the Typhoon FLA 9500 system (GE Healthcare, Uppsala, Sweden) and expressed as relative ratios normalised against the loading control, beta-actin. Results are expressed as mean ± standard error of mean of three individual experiments. Statistical significance of the data was assessed using SPSS software (version 24) by analysis of variance followed by least significant difference (LSD) analysis. P < 0.05 was considered statistically significant. MTT-based viability assay in [Figure 1]a shows that STZ inhibits Rin-5F cell survival in the presence of normal glucose in a dose- and time-dependent manner which confirms our previous study. No significant inhibition was observed after treatment with 1–5 mM STZ for 2 h, although a marginal inhibition (10%–15%) in cell viability was observed after treatment with 10 mM STZ. On the other hand, a significant inhibition was observed after 12 h of STZ treatment. [Figure 1]b shows the effect of STZ on cell viability in the presence of high glucose. As shown, a significant inhibition of viability was observed within 2 h of 10 mM STZ treatment. In comparison with normal glucose, the inhibition of cell viability was more pronounced in the presence of high glucose. As shown in [Figure 2]a, a dose-dependent increase (30%–50%) in ROS production was observed when cells were treated with 10 mM STZ at 24 and 48 h in normal-glucose medium. Cells treated with vehicle alone were used as the control. Pre-treatment of cells with NAC (10 mM) for 2 h caused a significant reduction in the production of ROS in STZ-treated cells. The STZ-treated cells at 24 and 48 h, respectively, were used as the control for the NAC pre-treated cells. As shown in [Figure 2]b, DNA fragmentation was induced in STZ-treated cells. Pre-treatment with NAC protected the DNA fragmentation induced by STZ treatment. Cells treated with vehicle alone were used as the control. The STZ-treated cells were used as the control for the NAC pretreated cells. A significant increase in protein carbonylation was also seen after treatment with 10 mM STZ for 24 h which was attenuated by pre-treatment with 10 mM NAC for 2 h [Figure 2]c. Cells treated with vehicle alone were used as the control. The STZ-treated cells were used as the control for the NAC-pre-treated cells. [Figure 3]a and [Figure 3]b shows the FACS analysis of cellular death/apoptosis after STZ treatment on Rin-5F cells. Apoptosis was increased (10%–20%) when cells were treated with STZ for 24 and 48 h in the presence of high glucose. No significant changes were observed with high-glucose alone. Cells treated with normal glucose were used as the control for high-glucose-treated cells and cells treated with vehicle alone in high-glucose medium were used as the control for the STZ-treated cells. Furthermore, we have previously shown that STZ treatment caused an increase in caspase-9/3-dependent apoptosis. In this study, we have further demonstrated that extrinsic, non-mitochondrial apoptosis was also increased as observed by an increase in caspase-8 activity in Rin-5F cells [Figure 3]c in normal-glucose medium. Again 48 h, treatment caused more (25%) activation of caspase than that seen after 24 h treatment (17%). 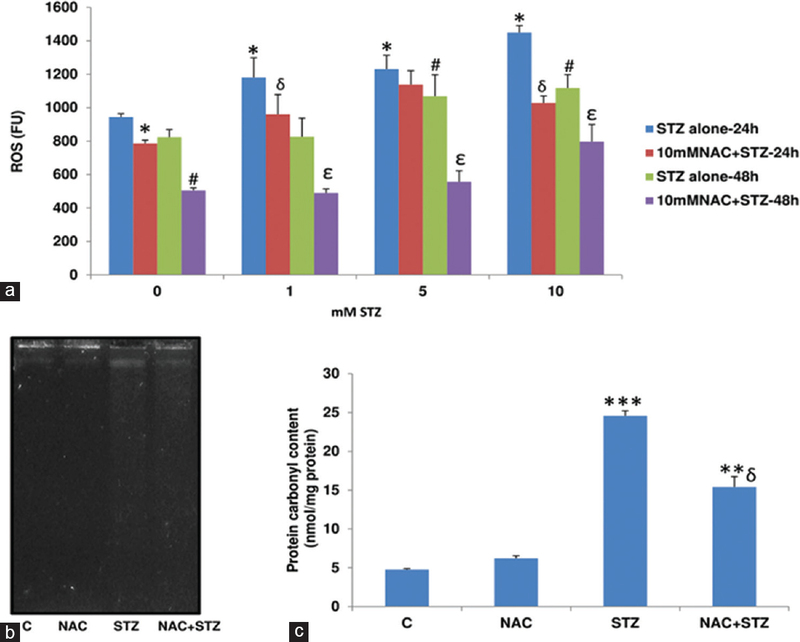 [Figure 4] shows increased expression of oxidative stress marker proteins, Hsp-70 and HO-1 after STZ treatment which clearly suggests and confirms our previous observations that STZ induces oxidative stress in these cells. These results suggest the oxidative stress-related alterations in the expression of signalling proteins. Beta-cell damage is a primary cause of type 1 diabetes, and therefore, studies on the mechanism of Rin-5F cytotoxicity would help in better understanding the mechanism of cell death. Our aim was to investigate the mechanism of STZ toxicity in the pancreatic cells under normoglycaemic and hyperglycaemic conditions, as well as its prevention using selective antioxidants such as NAC, a known scavenger of ROS. This may help in elucidating the precise mechanism of beta-cell damage and identify the potential targets in cytotoxicity and its prevention. To mimic hyperglycaemia, we treated insulin-secreting cells with high glucose (25 mM) to elucidate the effects on metabolic and oxidative stress induction in the presence and absence of NAC. Our results provide a better understanding of the mechanism of beta-cell toxicity and its prevention. This study also provides a better strategy for the protection or enhancement of beta-cell functions and hence a strategy to manage diabetes. Our previous studies, using STZ-induced type 1 as well as obese type 2 diabetic rat models have shown increased oxidative stress and mitochondrial dysfunctions in the pancreas and other tissues., Similarly, our study on STZ toxicity in vitro, using hepatoma HepG2 as well as Rin-5F cells, has also suggested increase in oxidative stress and mitochondrial dysfunction., Zhang et al. have shown the cytotoxic role of intermittent high glucose on apoptosis and cell survival in pancreatic cells. Our present study has further confirmed that STZ-induced cytotoxicity is indeed potentiated in the presence of high glucose and attenuated by prior treatment with NAC, a potent antioxidant and scavenger of ROS. A beneficial role of anti-oxidants and protection of pancreatic beta-cells against glucotoxicity has been shown by other researchers. Our previous study has presented significant molecular evidence of mitochondrial-initiated intrinsic apoptosis (activation of caspase-3 and caspase-9) in STZ-treated cells. In this study, we have presented additional evidence that the STZ-induced apoptosis and DNA fragmentation resulted in inducing extrinsic apoptosis as evidenced by increased caspase-8 activation. Again, as shown in the present study, the apoptosis of pancreatic cells treated with STZ was enhanced in the presence of high glucose, suggesting the increased stress on these cells in the presence of high glucose as seen in diabetic conditions. A recent study has shown that hepatocytes treated with STZ show induction of a caspase-8 homologue and critical regulator of caspase activation in a diabetic model. An increased expression of caspase-8 was also observed in diabetic rats, suggesting its involvement in increased cell death. Molecular evidence of increased oxidative stress after STZ treatment was also demonstrated by increased expression of oxidative stress markers, Hsp-70 and HO-1. Based on this study as well as our recent studies on the mechanisms of STZ cytotoxicity, we have presented a schematic model [Figure 5] to highlight the potential targets of STZ toxicity and attenuation by NAC in Rin-5F cells. Although our preliminary studies with NAC in Rin-5F cells have shown attenuation of oxidative stress after pre-treatment with NAC, further experimental evidence is required to prove these findings. A detailed study is in progress to study the mechanistic effects of NAC on different cellular models in the presence of high glucose and high fatty acids, mimicking diabetes. 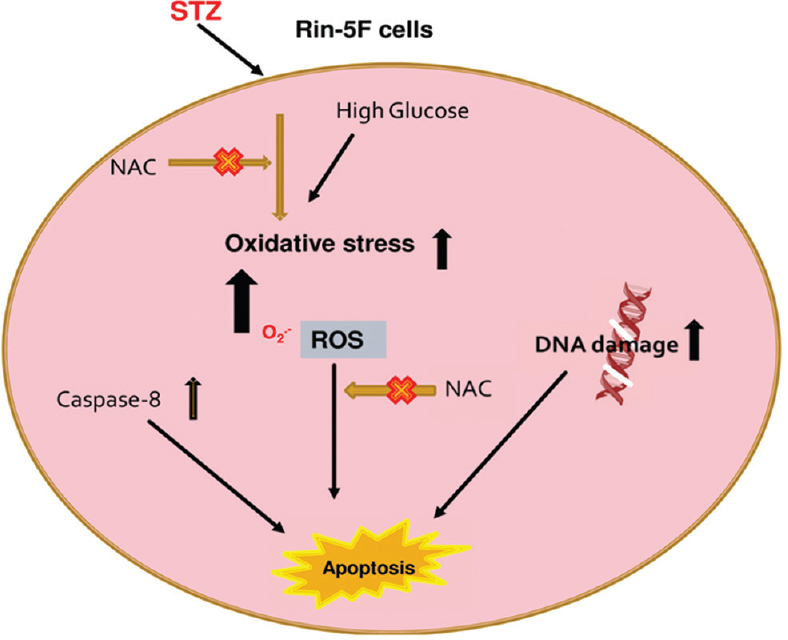 Increased oxidative stress as evidenced by decreased cell survival and increased apoptosis, which was potentiated by high glucose were observed in STZ-treated Rin-5F cells. In addition, increased ROS production, DNA fragmentation and protein carbonylation were observed after STZ treatment, which were attenuated in the presence of NAC. These results have implications in better understanding the metabolic and molecular responses of pancreatic Rin-5F cell when exposed to xenobiotics or abnormal endogenous nutrients. We wish to thank Sheikh Hamadan Medical Research Award (MRG-18/2013-2014) for their support in this study. A part of this research may be used in partial fulfilment of a PhD thesis dissertation (Arwa Munassar Thabet Al-Nahdi) at the College of Medicine and Health Sciences, UAE University, Al Ain, UAE. Liatis S, Dafoulas GE, Kani C, Politi A, Litsa P, Sfikakis PP, et al. The prevalence and treatment patterns of diabetes in the Greek population based on real-world data from the nation-wide prescription database. Diabetes Res Clin Pract 2016;118:162-7. American Diabetes Association. Diagnosis and classification of diabetes mellitus. Diabetes Care 2010;33 Suppl 1:S62-9. 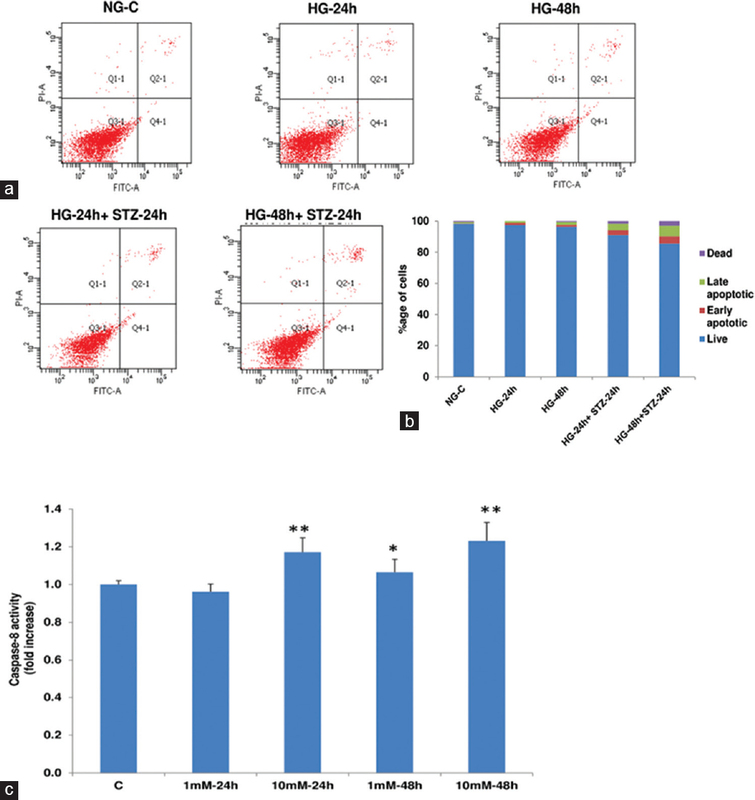 Tiedge M, Lortz S, Drinkgern J, Lenzen S. Relation between antioxidant enzyme gene expression and antioxidative defense status of insulin-producing cells. Diabetes 1997;46:1733-42. Tiedge M, Lortz S, Munday R, Lenzen S. Complementary action of antioxidant enzymes in the protection of bioengineered insulin-producing RINm5F cells against the toxicity of reactive oxygen species. Diabetes 1998;47:1578-85. Lenzen S, Drinkgern J, Tiedge M. Low antioxidant enzyme gene expression in pancreatic islets compared with various other mouse tissues. Free Radic Biol Med 1996;20:463-6. Gerber PA, Rutter GA. The role of oxidative stress and hypoxia in pancreatic beta-cell dysfunction in diabetes mellitus. Antioxid Redox Signal 2017;26:501-18. Butler AE, Janson J, Bonner-Weir S, Ritzel R, Rizza RA, Butler PC. Beta-cell deficit and increased beta-cell apoptosis in humans with type 2 diabetes. Diabetes 2003;52:102-10. Robertson RP. Chronic oxidative stress as a central mechanism for glucose toxicity in pancreatic islet beta cells in diabetes. J Biol Chem 2004;279:42351-4. Eizirik DL, Colli ML, Ortis F. The role of inflammation in insulitis and beta-cell loss in type 1 diabetes. Nat Rev Endocrinol 2009;5:219-26. Wu L, Nicholson W, Knobel SM, Steffner RJ, May JM, Piston DW, et al. Oxidative stress is a mediator of glucose toxicity in insulin-secreting pancreatic islet cell lines. J Biol Chem 2004;279:12126-34. Eleazu CO, Eleazu KC, Chukwuma S, Essien UN. Review of the mechanism of cell death resulting from streptozotocin challenge in experimental animals, its practical use and potential risk to humans. J Diabetes Metab Disord 2013;12:60. Raza H, Prabu SK, Robin MA, Avadhani NG. Elevated mitochondrial cytochrome P450 2E1 and glutathione S-transferase A4-4 in streptozotocin-induced diabetic rats: Tissue-specific variations and roles in oxidative stress. Diabetes 2004;53:185-94. Duchen MR. Roles of mitochondria in health and disease. Diabetes 2004;53 Suppl 1:S96-102. Karunakaran U, Park KG. A systematic review of oxidative stress and safety of antioxidants in diabetes: Focus on islets and their defense. Diabetes Metab J 2013;37:106-12. Rolo AP, Palmeira CM. Diabetes and mitochondrial function: Role of hyperglycemia and oxidative stress. Toxicol Appl Pharmacol 2006;212:167-78. Simmons RA. Developmental origins of diabetes: The role of oxidative stress. Free Radic Biol Med 2006;40:917-22. Raza H, John A, Howarth FC. Increased metabolic stress in zucker diabetic fatty rat kidney and pancreas. Cell Physiol Biochem 2013;32:1610-20. Islam MS, Loots du T. Experimental rodent models of type 2 diabetes: A review. Methods Find Exp Clin Pharmacol 2009;31:249-61. Wei L, Lu Y, He S, Jin X, Zeng L, Zhang S, et al. Induction of diabetes with signs of autoimmunity in primates by the injection of multiple-low-dose streptozotocin. Biochem Biophys Res Commun 2011;412:373-8. Hosokawa M, Dolci W, Thorens B. Differential sensitivity of GLUT1- and GLUT2-expressing beta cells to streptozotocin. Biochem Biophys Res Commun 2001;289:1114-7. Friederich M, Hansell P, Palm F. Diabetes, oxidative stress, nitric oxide and mitochondria function. Curr Diabetes Rev 2009;5:120-44. Liu HK, McCluskey JT, McClenghan NH, Flatt PR. Streptozotocin-resistant BRIN-BD11 cells possess wide spectrum of toxin tolerance and enhanced insulin-secretory capacity. Endocrine 2007;32:20-9. Tuch BE, Beynon S, Tabiin MT, Sassoon R, Goodman RJ, Simpson AM, et al. Effect of beta-cell toxins on genetically engineered insulin-secreting cells. J Autoimmun 1997;10:239-44. Katyare SS, Satav JG. Effect of streptozotocin-induced diabetes on oxidative energy metabolism in rat kidney mitochondria. A comparative study of early and late effects. Diabetes Obes Metab 2005;7:555-62. Raza H, John A. Streptozotocin-induced cytotoxicity, oxidative stress and mitochondrial dysfunction in human hepatoma hepG2 cells. Int J Mol Sci 2012;13:5751-67. Nahdi AM, John A, Raza H. Elucidation of molecular mechanisms of streptozotocin-induced oxidative stress, apoptosis, and mitochondrial dysfunction in rin-5F pancreatic β-cells. Oxid Med Cell Longev 2017;2017:7054272. Raza H, John A. Implications of altered glutathione metabolism in aspirin-induced oxidative stress and mitochondrial dysfunction in HepG2 cells. PLoS One 2012;7:e36325. Raza H, Prabu SK, John A, Avadhani NG. Impaired mitochondrial respiratory functions and oxidative stress in streptozotocin-induced diabetic rats. Int J Mol Sci 2011;12:3133-47. 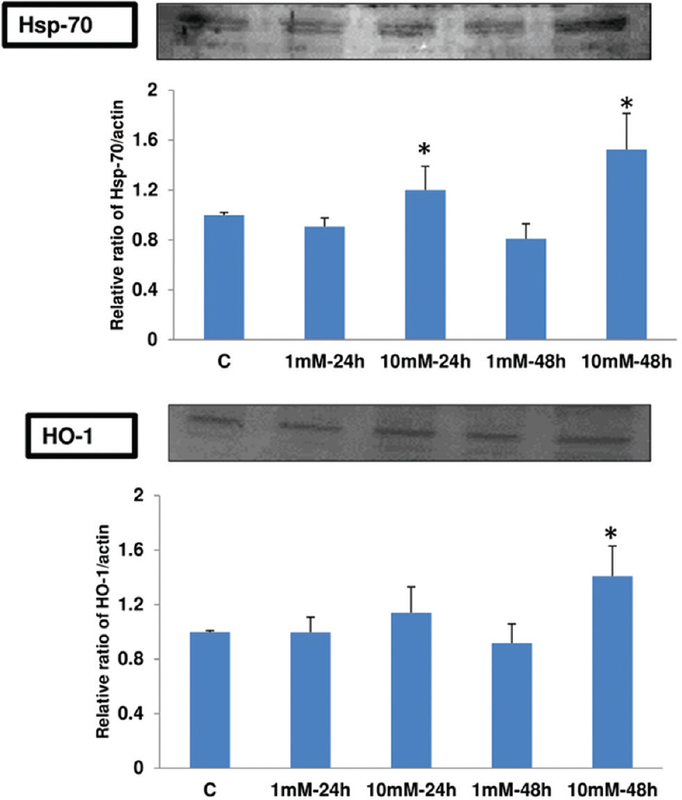 Raza H, John A, Benedict S. Acetylsalicylic acid-induced oxidative stress, cell cycle arrest, apoptosis and mitochondrial dysfunction in human hepatoma hepG2 cells. Eur J Pharmacol 2011;668:15-24. Zhang Z, Li J, Yang L, Chen R, Yang R, Zhang H, et al. The cytotoxic role of intermittent high glucose on apoptosis and cell viability in pancreatic beta cells. J Diabetes Res 2014;2014:712781. Kaneto H, Kajimoto Y, Miyagawa J, Matsuoka T, Fujitani Y, Umayahara Y, et al. Beneficial effects of antioxidants in diabetes: Possible protection of pancreatic beta-cells against glucose toxicity. Diabetes 1999;48:2398-406. Kohl T, Gehrke N, Schad A, Nagel M, Wörns MA, Sprinzl MF, et al. Diabetic liver injury from streptozotocin is regulated through the caspase-8 homolog cFLIP involving activation of JNK2 and intrahepatic immunocompetent cells. Cell Death Dis 2013;4:e712. Arroba AI, Frago LM, Argente J, Chowen JA. Activation of caspase 8 in the pituitaries of streptozotocin-induced diabetic rats: Implication in increased apoptosis of lactotrophs. Endocrinology 2005;146:4417-24.